A timeless beauty, genuine leather leash with a row of medium size genuine Swarovski stones set close together. Custom designer lead allows you to decide from all clear stones or alternating color stones. If you decide on all clear write clear or if you would like an alternating color pick one from the stone color chart below, so it will have either all clear stones or clear with the alternating color of your choice. Proudly crafted in the USA. Please choose the size, color of leather and color of alternating stones. You may choose clear for an all-clear stone collar. All our leashes are created from the original hide of leather. There are times when the skins may be smaller and it prevents us from creating a leash in one length. When this occurs we will use a swivel connector automatically. Hand made to order and by crafted artisans in the USA. We estimate delivery as approximately 4-5 weeks but will try our best to get it to you sooner. Quality and attention go into every detail of this handcrafted designer leather dog lead ensuring it will truly be worth the wait. 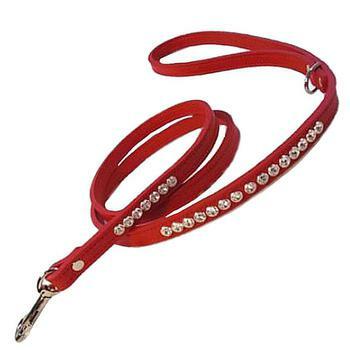 This is a custom made to order dog lead and not eligible for exchange or return. 4 ft x 1/2", 4 ft x 5/8", 4 ft x 3/4", 4 ft x 1"
5 ft x 1/2", 5 ft x 5/8", 5 ft x 3/4", 5 ft x 1"
6 ft x 1/2", 6 ft x 5/8", 6 ft x 3/4", 6 ft x 1"